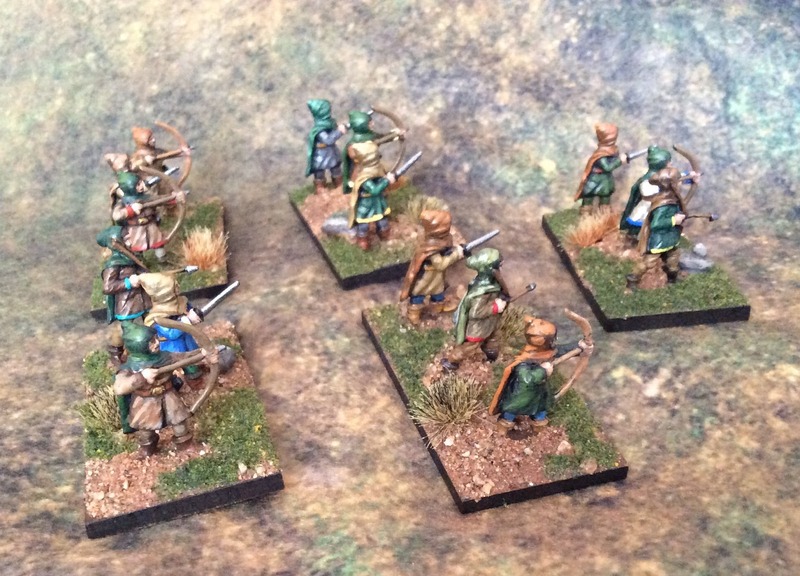 25mm Minifigs Elvish Reinforcements | H.A.W.K.S. I’ve decided that the next couple of months will be devoted to painting a few pending projects. One of these is the vintage Minifig Middle Earth bands. I inventoried all of my carefully gather stocks recently and concluded that I have about three hundred to paint, so I hope eventually to have a game like the one I wanted in 1974 when I first bought these. 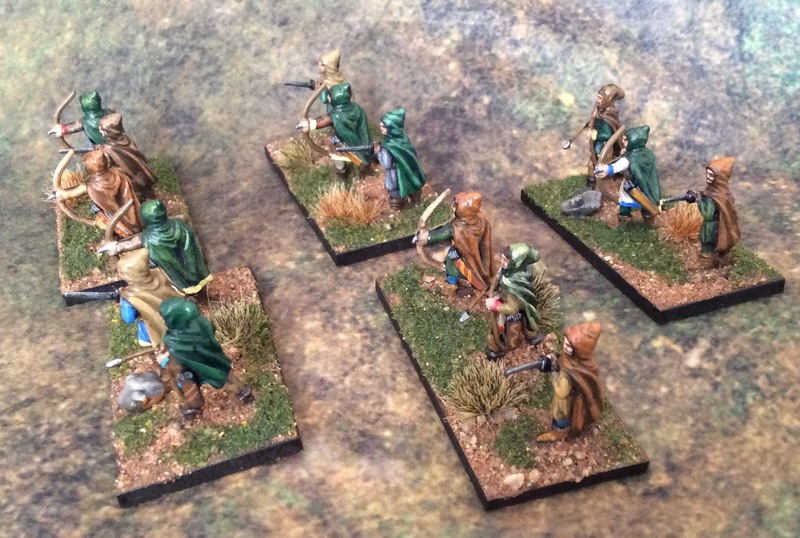 I had a team of 15 elvish reinforcements in process, and finished them up over the weekend. I am anticipating that they will be used for Dragon Rampant, but I am trying to keep the basing fairly flexible. The stand of three is an anomaly. I stumbled into a handful of ME figures at Cold Wars in 2015, including three elves and seven dwarves. Having not seen any in years, I did not anticipate that I would be able to find any more, so I gave them special base treatment. With another twenty or so on hand, awaiting painting, I now expect that I will end up with a second base done to match that one (and to form a Dragon scout unit), a second command stand, a pair of mounted elves, and a handful of singles. The current two and a half units of twelve should become four. I’m working on some goblins and orcs this week, but I think that I will set up a dozen human spearmen (really Saxons but ready to stand in for Lakemen, Rohirrim, or Dunlendings) next, so that I can field a basic 24 point Dragon Rampant war band of the northern allies after the Battle of the Five Armies. I like the look of these a lot! Nice variation of colours and very thematic bases. 300 minis to paint?! That made my brain explode. I don’t even want to count mine, as I’m afraid of what that number might be. Seriously though, nice work on these and you have a really nice color scheme going.